This web page took an hour to scan, research, design, and upload. Thank you for supporting the Virtual Steam Car Museum! 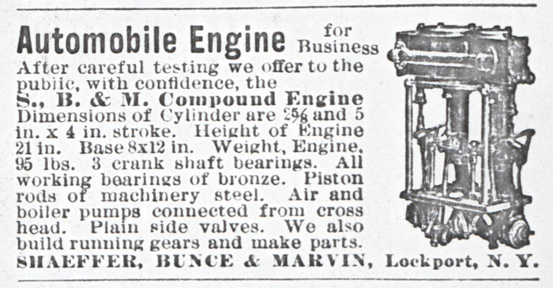 shaeffer, Bunce, and Marvin advertised a compound steam engine for automobiles in 1901. This advertisement appeared in an unknown 1901 magazine. It promoted the Schaeffer, Bunce, & Marvin compound steam engine for automobiles. Photocopy. John A. Conde Collection. 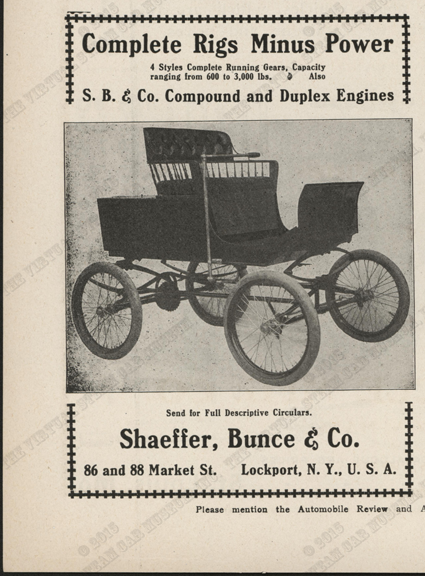 The Automobile Review and Automobile Newscarried this Schaeffer, Bunce, & Marvin advertisement in May 1902 on opage 8. John A. Conde Collection. Contact us if you have additional information about Shaeffer, Bunce, and Marvin, or if you have questions.